Zapier allows you to connect your Big Cartel shop to over 500 apps to automate things like email marketing, social media promotion, accounting, customer management, and more. 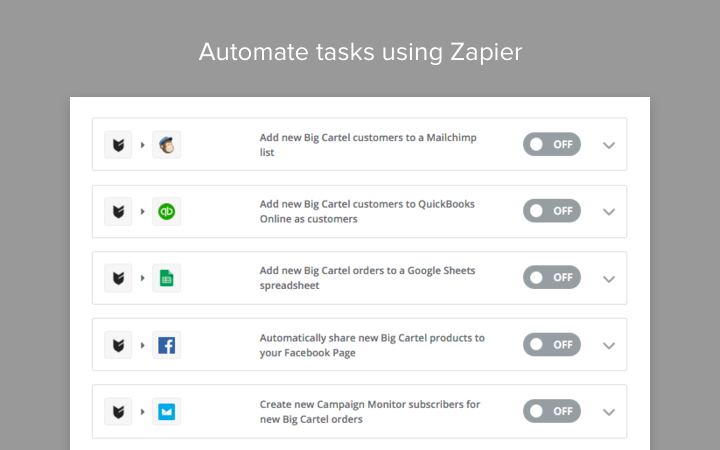 Use Zapier’s “Zaps” to automate tasks with no code required. See some popular Big Cartel Zaps! If you haven’t already, sign up for Zapier. Use an existing Big Cartel Zap or create a new Zap for Big Cartel. Zapier will walk you through the remaining steps for your specific Zap.